Learn new skills, make new friends, explore different career paths, and more! Apply online today! Something fun is coming your way! 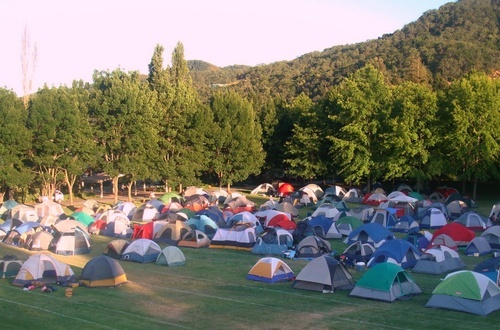 Join us for a full season of events including tasty BBQs, camp nights, and more! Whether you're staying in a nearby hotel, or enjoying one of our Camp Nights...find cozy and comfortable accomodations just right for your vacation. Enjoy unlimited visits to the park and FREE parking all season long. Best of all, a Premium Card includes the 2019 Gardens at Night Halloween and Holiday, discounts, Bring-A-Friend FREE Fridays, and more! 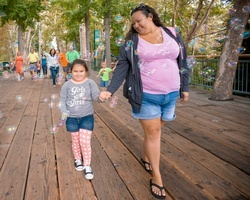 Gilroy Gardens is about fun for everyone! Here's all those with disabilities need to know to navigate and enjoy the park and all of its experiences. 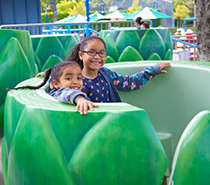 Gilroy Gardens Introduces Record-Setting Fun this Summer with GUINNESS WORLD RECORDS™ LIVE! May 23, 2017 (Gilroy, CA): This summer, guests at Gilroy Gardens Family Theme Park will learn about the science of record-breaking while attempting to set official world records. The family theme park is partnering with GUINNESS WORLD RECORDS LIVE! to host an action-packed show, provide interactive experiences throughout the park, and make official attempts at existing world records. The GUINNESS WORLD RECORDS LIVE! show will run daily at the Lakeside Amphitheater from June 10 through August 14. At each performance, the audience will learn about the science of record breaking and have the opportunity to practice, attempt, and even break actual records in real time onstage. The GUINNESS WORLD RECORDS LIVE! show is co-produced by RWS Entertainment Group, a New York-based production company that specializes in custom entertainment, live events and brand experiences. Kids of all ages will also be invited to join the “GWR Club,” pick up a GWR Passport, and search throughout the park for GUINNESS WORLD RECORDS memorabilia and exhibits. At each station, passport holders can collect stamps featuring famous records from around the world. Gilroy Gardens guests will also be invited to participate in two GUINNESS WORLD RECORDS Official Attempts. The first is for Most people contributing to a stamp image. The current world record is 3,154 people, achieved by LIVAT Center (China) in Beijing, China on April 30, 2017. Throughout the summer, park guests will use rubber stamps to create a giant image of park’s signature Basket Tree. The image will eventually be displayed against the backdrop of the Lakeside Amphitheater. The second Official Attempt will be the Largest tree hug. The previous record was set in a forest in Thiruvananthapuram, India on March 21, 2017 and consisted of 4,620 people all hugging trees for one minute at the same time. 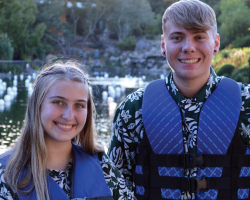 Park organizers plan to attempt breaking that record at Gilroy Gardens Family Theme Park on Saturday, August 12, with official adjudicators from GUINNESS WORLD RECORDS on hand to certify the official record. Gilroy Gardens Family The me Park is a 501(c)(3) nonprofit corporation and California’s only horticultural theme park. Founded by Michael Bonfante, the park offers a unique family experience centered around trees and plants with an emphasis on local history. 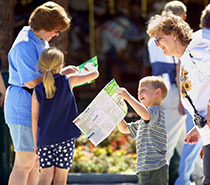 The park’s mission is to offer safe, clean, family entertainment in natural landscapes while educating guests on the importance of horticulture, agriculture, and local history. The park features over 40 rides and attractions and more than 10,000 trees, including the world-famous Circus Trees. For more information, visit www.gilroygardens.org. Operating out of a 39,000 square foot office and rehearsal studio complex together with performer housing in New York City, Emmy Award-winning RWS Entertainment Group is North America’s largest provider of branded stage shows and experiences. Founded in 2003, the multi-award winning live entertainment production company has produced innovative productions and custom brand experiences for top resorts, cruise lines, theme parks, corporate events and NYC fashion events for an impressive roster of clients that include Holland America Line, Hard Rock Resorts, Prada, NBCUniversal, Cedar Fair, Hershey Entertainment and Resorts, Westfield, Macy’s, Vera Wang, Mattel, to name a few. In July 2016, RWS acquired 12-time Artios Award-winning Binder Casting, a leading casting firm for Broadway, film and TV. For more information about RWS Entertainment Group, please visit rwsnyc.com, Facebook, Instagram, and Twitter.